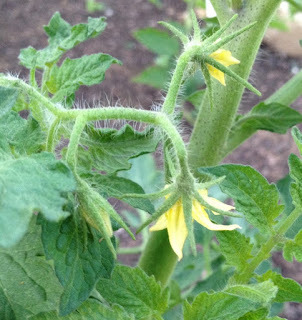 Welcome to Garden Bloggers' Bloom Day for June 2013. Here in my USDA Hardiness Zone 6a garden in central Indiana, I followed my usual routine for bloom day and went around the garden noting blooms and taking pictures. Then I came inside, uploaded all the pictures and went back through old bloom day posts, comparing what is blooming now to what was blooming on this same day in June from 2007 through 2012. Those old bloom day posts give me proof that this year's garden is still lagging behind previous years by about a week or more. It's the truth! I cannot tell a lie around Ithuriel's Spear, Triteliea 'Rudy'. It is blooming late in the front garden, but is just about the only flower in front right now, other than some fading violas and Knockout 'Radsunny' roses and a few slender spikes of Heuchera. Out in the back, it's hard to miss the Oso Easy 'Cherry Pie' rose blooming on the edge of the garden border I call 'The Shrubbery'. On the other side of the chairs, Shrubby Cinquefoil, Potentilla fruticosa, is blooming. It's never going to be quite as showy as the rose, but it's nice, too. Plopper's Field, where plants are plopped in wherever there is a bare spot that looks like a good place for a plant, is a bit of a mess right now. By this day in previous years, the daylilies that are growing in Plopper's Field were blooming. This year, there are merely remnants of Digitalis sp., Coreopsis sp., Clematis integrifolia 'Alba', and common ol' daisies blooming. I'm sure the old saying applies. "You should have seen it last week." Or maybe, "It's going to be a lot nicer next week". On the edge of Plopper's Field, I found a little tiny Clematis, in bloom. There is just one stem, one bloom. I have no idea which Clematis it is. I do know that this one is Clematis 'Rooguchi'. I think this is the Clematis that got me hooked on Clematis in general and made me realize that there is more to this genus than 'Jackmanii'. 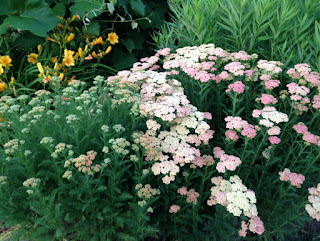 Near the entrance to the Vegetable Garden Cathedral, yarrow, Achillea sp., is blooming. Yes, behind it are some 'Stella d'Oro' daylilies. I've tried to evict those from the garden but somehow a clump of them remains. 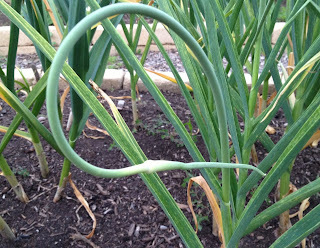 In the Vegetable Garden Cathedral, there's a garlic scape or two. I cut these off so that all the plant's energy is spent on bulb formation. 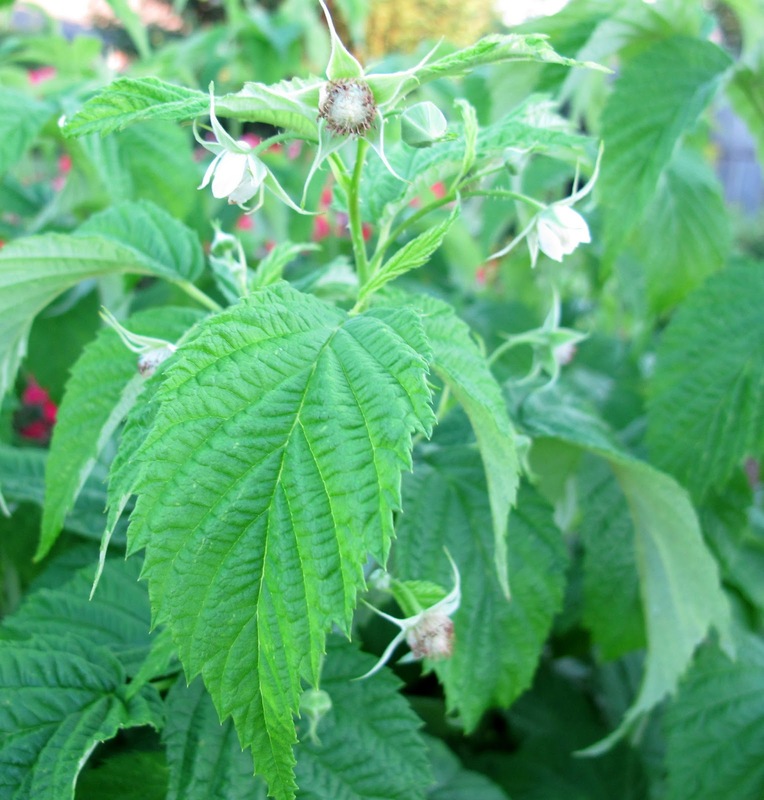 There are also fading blooms on the raspberries. This surely means that fresh raspberries will soon be part of my dinner. One last bloom in the vegetable garden delights me. I hope by the next bloom day, I have tomatoes to eat. What other blooms are there to see on the 15th of June at May Dreams Gardens? Oakleaf hydrangeas, hostas, ditch lilies, to name a few, along with fading pansies and violas and the slender spikes of Heuchera. What's blooming in your garden in this month of June? We'd love to have you share your blooms on the 15th of each month by joining us with your own Garden Bloggers' Bloom Day post. Just post on your blog about what is blooming this month in your garden and then come back here and leave a link to your blog post in the Mr. Linky widget below along with a brief comment to let us know you've posted. Carol-Your gardens seem to be coming along nicely and your roses are lovely! We have had the same weather pattern here with highs in the upper 60's to low 70's at the end of June. The frequent April-like rains have sparked everything to grow rapidly and the blooms are finally coming-perhaps more than a month behind. Happy GBBD and thanks for hosting! Happy GBBD! I love that yarrow shot! Thanks for hosting the GBBD again, it is really nice to have this record to look back at and compare, and yes, my garden is really, really late this year, some plants about 6-7 weeks late! Here in London we have had the coldest spring on record and the start of summer hasn't been much to brag about either..but we're getting there! Happy GBBD! Thanks for inventing it! I love to visit gardens all over the world and to get some inspiration. Best wishes and happy gardening! Lovely to see your pictures. My garden is right on time this year, as we move into winter. I'm enjoying some of my seasonal favourites like camellias and wintersweet. Happy bloom day! My records for my current garden don't go back far enough for me to say whether blooms are ahead, on par, or behind this year in my area. Thanks for hosting GBBD, Carol! P.S. That 'Cherry Pie' rose looks as though it glows might glow in the dark - does it? We're a little behind in the Chicago area too, as the cool temperatures continue. The tomato plants here are small - this year was a record for how late they were put in the garden, and I know we won't have tomatoes by next Bloom Day. I love to sit on those chairs while having coffee and watching the garden. I am amazed at the health of that tomato plant, it is having a great promise of plenty of fruits. Thanks for hosting. Hi Carol - we're lagging behind in the UK too. Thank goodness for the alliums, they've been a real lifesaver bloom for many a garden this year. What a delicate little clematis. VP's right, it certainly has been a good year for alliums here. The peonies are looking really good too. Perhaps all that rain last year suited them. That 'Cherry Pie' Rose is simply spectacular. What a gorgeous colour. Your shrubbery is looking wonderful and what a wonderful spot to sit and while away an hour or so. Everything is behind here too. Thanks for hosting! We appreciate the meme Carol, thanks for the hosting! Thank you Carol for hosting Bloom Day once more. I love your Cherry Pie ros, such a bright happy colour and your Rooguchi clematis, so sophisticated! You have a lovely garden and I will enjoy visiting in the future. Interesting to hear that your blooms are lagging behind too. 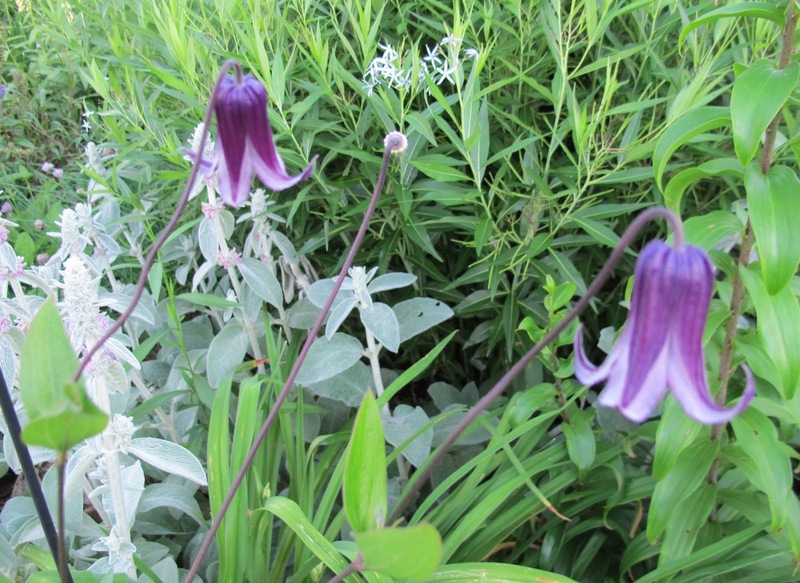 The contrast of clematis 'Rooguchi' with the grey leaves of 'Lamb's Ears' is most attractive. Thanks as always for hosting. I performed the same exercise that you did, and also found my garden is later this year, but after record breaking heat this week, things are getting more normal. Happy Garden Bloom Day to you, Carol, and thank you for hosting. It's been a really strange season so far... April and June flowers blooming in the same month! Interesting to read that it's pretty much the same all over. Healthy looking raspberries Carol - my favourite too! Wonderful round up Carol. I agree we are at least a week behind due to cool rainy weather. But those darn weeds are still ahead of me....thanks for hosting!! I love Clematis 'Rooguchi' also! Mine is just beginning to bloom here in zone 4. Tomatoes? Not looking good. It has been cool. I think they are waiting for summer. I have yet to see a garlic scape but I like to eat them so I'll be looking more closely. Like you Carol, I am looking forward to a good tomato harvest this year. My garlic is beginning to yellow off so it won't be long before they are lifted. Thanks for hosting. Beautiful gardens everywhere! Happy June. Thanks for being our fabulous host! Your rose is delightfully vibrant. Nice to have a shrubbery in case the Knights who say Ni happen by and demand one! Happy GBBD! Yay for Tomato blooms! Every year is different, this is the year of lateness everywhere but we'll catch up. Thank you for being a super host for Bloom Day. Happy Bloom Day...I hope it isn't as hot for ya'll as it is here in the deep south. Those chairs by the rose look sooo inviting, Carol. Thank you for hosting. I love visiting other people's gardens. Your June garden looks beautiful Carol! Thanks for hosting this fun meme. 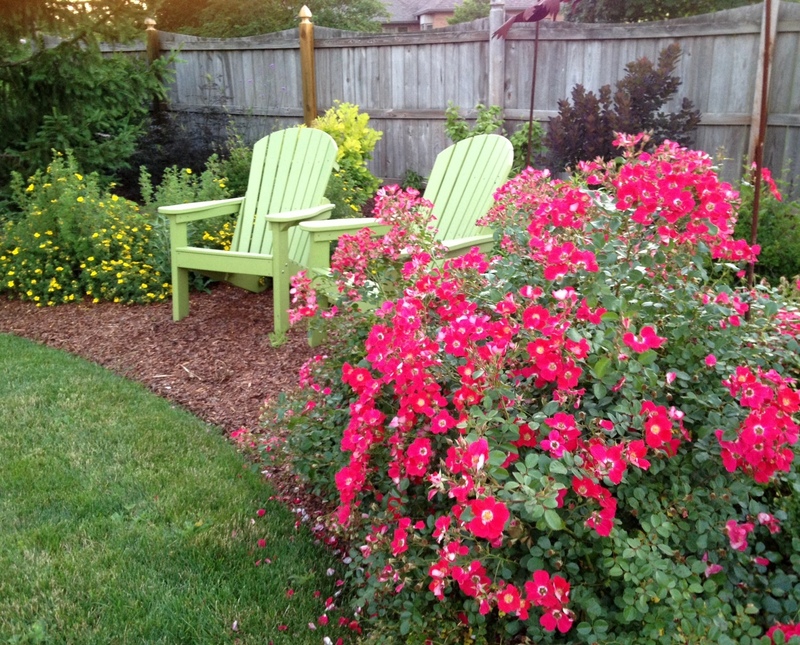 Two adirondack chairs are on my wish list for my own garden. I love the color that you chose for your chairs. It offsets the color of the rose bush perfectly! Happy GBBD! We are also a week or two behind other years' bloom times here in the Mid-Atlantic - but I am not complaining -- a long, cool spring is unheard of here and something I'm definitely enjoying! thank you so much for hosting! I wrote a little bit about how much I enjoy writing these posts because they help me to focus and I love looking at the other posts. I could spend the day reading these if it wasn't such a beautiful day outside. I'll get back to them later for sure! Happy bloom day! Your "shrubbery" area looks so inviting. Love the color of those chairs, too. I think we are also lagging behind in blooms about a week or so. But it's getting very hot here now, so I expect things to start evening out. Thanks for hosting. Beautiful! I hope that if your early summer is slow, your late summer and early fall will last longer too this year. Your garden is gorgeous!! What a great idea to check back as to what was blooming then and now. I'm sure most gardens are behind this year. Still June is one of the loveliest month for blooms so let's enjoy! We've had an unusual spring here too, in upstate New York. Cold and rainy-our rivers are running high, leading to some anxiety (we had major floods in 2006 and 2011). But my flowers aren't seeming to mind the weather-yet. Alana @RamblinGarden. I left out my 'mater shot, but I'm happy to see yours are blooming too! I can't wait to pluck our first homegrown tomato. As always, lovely, lovey garden. Thanks for hosting GBBD! I shared some photos of wildflowers growing in our lawn! Everything is right on schedule here, except for an echinacea that decided to make an early appearance! Like the clematis, much. Thanks for the meme. That tiny Tritalia is just lovely Do you eat your garlic scapes after you cut them off? I hear they're tasty but have never tried them myself. Love when roses are so dense with bloom like your Cherry Pie. And the pink yarrow is really pretty next to the daylilies (even if they are eviction survivors). Happy Bloom day! Thanks for being the hostess with the mostess, Carol! Thanks once again for hosting. Thanks for hosting! I have several clematisblooming. Durandii, a light lavender one, it's name has escaped me, Nellie Moser, and Jacmanii. I have all my hydrangea blooming, also. 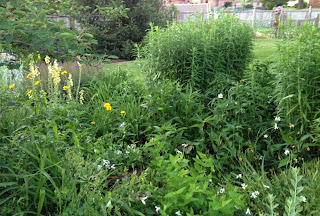 I stil have Ox eye daisies and Iceland poppies blooming. Everything looks lovely in your yard, even in Ploppers Field (I just love that concept). Your achillea is especially stunning. I'm highlighting my neighbor's "June Teenth" daylily, right in time for Juneteenth. The GBBD event is fun but it is also so valuable in the kind of records it gives each of us from month to month and season to season. Now your post has made me want to check where my blooms are against previous years. I'd love to grow that 'Rooguchi' myself. Must start looking for a good place for one. Gorgeous! I cant believe that Novembe 2012 was my last contribution! It is so lovely to be able to see what is growing around the world on the same day. Your Potentilla is way ahead of mine but my raspberries and tomatoes look as though they are probably only about 2 weeks behind. Thank you this meme. Thank you for introducing me to the concept of Garden Blogger's Bloom Day! My potentilla is in flower too Carol though I didn't feature it in my blog post today. The clematis are much later this year so hopefully I'll have some next month in flower. Surprised at how quickly some of my herbaceous plants have caught up as we were about 6 weeks late with the season here in Scotland a few months ago. I do like your description of Ploppers field. It matches my front garden!! Thanks for hosting - Happy GBBD! I've been thinking, too, that it's too bad Bloom Day wasn't last week...or maybe next week. Still you have some lovely blooms, Carol--'Cherry Pie' just invites people to sit awhile and admire it! And that tomato blossom sure looks promising. Thanks for the reminder to go check my raspberries! I noticed that my garden is also lagging behind its usual schedule. But after last year, who's complaining? 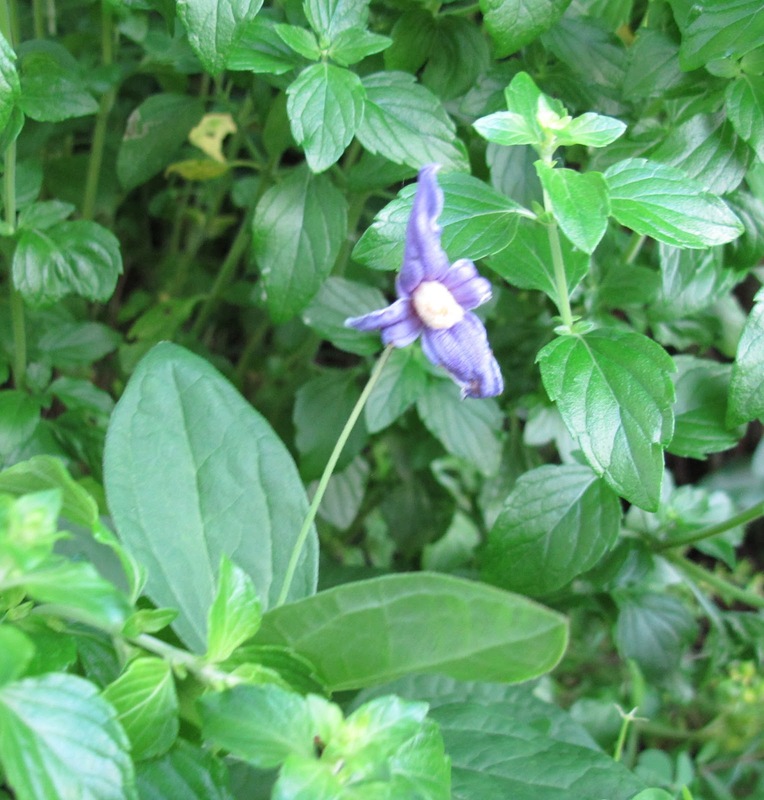 Your mystery Clematis sure does look like durandii, as Helen suggested. Do you recall planting that? 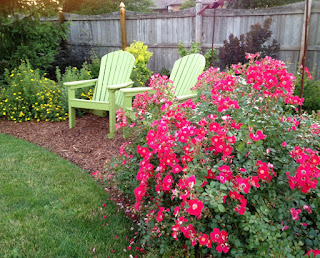 I'd just love to come and sit on one of those chairs among the 'cherry pie' roses. Love that clematis too. SO like our native one. Happy Bloom Day Carol. Thank you so much for hosting. I love seeing everyone's garden progress from here in Pasadena, California. This is my first time joining your Bloom Day theme. It is so much fun to look through the different gardens and see what's blooming around the country! By the way, I love the name "Plopper's Field"! Darn - I wish I'd thought of that one! I've got Rooguchi clematis too - it's a favorite of mine. I also hope you have tomatoes to show off with your July blooms. I have one, tiny (if I squint just right I can convince myself it really is a tomato) fruit just starting to form. Almost midnight! That was a close one. The 'Cherry Pie' rose is lovely...it could also be named 'Cheery Pie'! My little 'Rooguchi' clematis is also in bloom. I really like the bell shaped flowers. 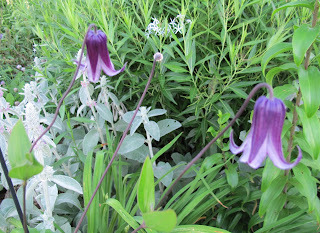 Mine grows beside clematis 'Harlow Carr' who is almost the same color. Thank you for hosting another Bloom Day! Late as ever, but it's nice to have been able to participate at all. I'm still missing my vegetable garden, so I gave myself a tour of Cornell Plantations. It was a pleasant day. Love the shape and color of your Rooguchi, wistfully. It is one that bit the dust for me. I'm mainly featuring roses this month, with a few Clematis thrown in. Happy GBBD. Garden looks wonderful. Love the sweet bell clematis. Love the lime green adirondacks. And I envy being able to plop clematis and have it grow like yours. Happy Bloom Day, Carol. Yum fresh garlic. I will have to plant some this fall. Happy GBBD. Yes I am late. I have a good excuse. I was busy weeding and wore myself out. Plus, I love that bell-shaped clematis. I've never seen one like that before. Lovely. I'm glad I'm not the only one to find that her garden is lagging behind where it usually is at this time. It's only my second year in this garden, and most of the plants were just planted last year. I wasn't sure if it was the newness that made it lag behind, or the weather. 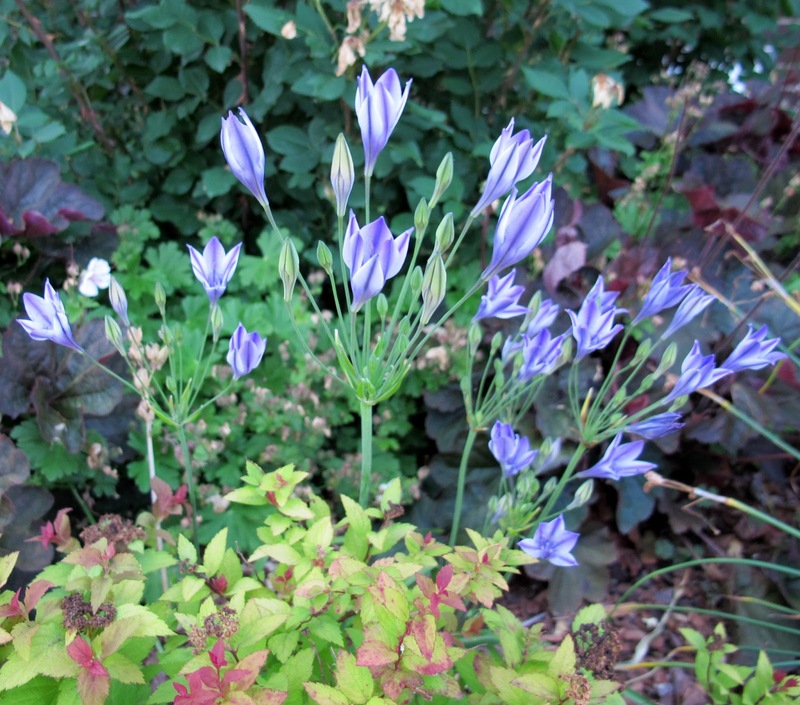 I think the "mystery" Clematis is a seedling of Clematis integrifolia. It is the normal blue flowered form. I'm late to the party, as usual. happy bloom day! So fun to share whats blooming in our gardens! Thank you for making it possible. My contribution to GBBD is extremely late - apologies - but better late than never. I find it a useful way to keep a time lapse record of my garden as well as getting to experience all the Others on your site. Thank you for hosting. Guess I'm a bit of a late bloomer but only heard about the June Blooms challenge last weekend. It's the last day of June, and I know you're in Seattle at the 'fling...but I wanted to get in before July hits. Late as always...but better than Never! Just learned about Garden Bloggers' Bloom Day over on Google+. Jumped right in and cranked out a post! Great incentive to dig out the accumulated plant labels and order forms so that I could properly identify the plants. Great fun! Thanks for the creative initiative!